It was last used in 1913 and the stone-built tower with its wooden cap and machinery has been restored and visitors can explore its four floors. See how the mill once operated with the help of the working model. 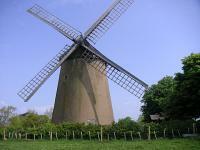 The mill also provided breathtaking views across glorious, unspoilt countryside. From Sandown follow B3395 to Bembridge. Turn left following brown signs. Layby on the left.